Assistant Director of the Division of Conservation, Johnna McHugh, sat down with Carrie Searcy, editor of Land, Air & Water webzine, to discuss the Jim Claypool Art Contest and the Conservation Writing Contest. The art contest features students’ work in grades one through five and the writing contest is for students in grades six through 12. Both allow students to use the knowledge they have gained about the environment and transform it into artwork and written essays. This contest has been around for a long time. Can you tell me a little bit about its history? It’s been around since 1944, so that’s 73 years! Each year, Kentucky’s teachers present conservation lessons in their classrooms in conjunction with the Kentucky Association of Conservation Districts (KACD) and other partners. The students then use what they have learned to create posters and essays to demonstrate their knowledge of the topic. This year’s topic was Backyard Adventures: Exploring the Trees in Your Hometown. What is your role in the competition? I get everything together, which is a large undertaking, but is also very rewarding, especially when dealing with the children. What is your favorite thing about the writing and art competition? That kids are learning about the environment. I remember doing the art contest when I was in elementary school, and I loved thinking hard about my poster and what I was going to draw. How do you come up with themes each year? We have four rotating topics that we rotate among – forestry, water, soil, and wildlife. A committee of agency folks and sponsors get together in the spring to plan for the contest – talk about the theme, divide up the work, that kind of thing. Melissa LaRoche of Kentucky Farm Bureau does all the layout, and she usually comes up with the title also. How do you narrow the entries down? This year there were almost 16,000 entries! Each school collects their entries and chooses a top three, which they send to the local conservation district. The local conservation district then chooses a county winner in each of the contests. They also choose school winners and runners up for local recognition. So we receive in our office approximately 100 posters and 90 essays per year. I invite judges from agencies and our sponsors, and we usually have around 12 people come to judge. I divide those 12 into teams that will judge nine Conservation Districts. They receive approximately 20 essays weeks before the day of the judging so they can take their time reading them. On the day of the judging, they work within their teams to choose a winner and runner up from each area. Then all the judges read the nine area winners and choose a state 1st, 2nd and 3rd place winner from those. After they’re finished with the essays, the judges move on to the posters. They look at all the posters from each area and choose a winner and a runner-up. The nine area winners are then judged again to choose a state 1st, 2nd and 3rd place. What kind of prizes do the winners of each category receive? The Kentucky Farm Bureau Federation provides the monetary prizes. The state winner receives $250. Second place receives $150. Third place and the area winners receive $50. County winners receive $25. The local conservation district generally also awards prizes. Do you see the same kids return each year to participate? We occasionally see the same names for multiple years. It doesn’t happen very often that they make it to the state level, but from our conversations with the local districts they see the same kids year after year. Kentucky Farm Bureau seems very supportive. How did that relationship develop? The Kentucky Farm Bureau Federation has always been very supportive of our educational programs. Not all conservation agencies across the country can say that, but we have a very close relationship in Kentucky. For most of the contest’s history, the Louisville Courier-Journal was a large sponsor. They did the layout of our tabloid, did some of the writing of the articles within, and printed enough copies of the tabloid so that every student in Kentucky received one. After the 2007 contest, the Courier-Journal decided to stop sponsoring the program for budgetary reasons. At that point, the Farm Bureau Federation took over the layout duties. We put an electronic version on our website and the Farm Bureau Federation website. The Kentucky Association of Conservation District Employees now have the tabloids printed for districts who still want to distribute hard copies. Most districts take advantage of that service. The 2017 state winners of the Jim Claypool Art Contest and the Conservation Writing Contest attended an award ceremony held in their honor on Feb 28th at the Capitol Education Center in Frankfort. 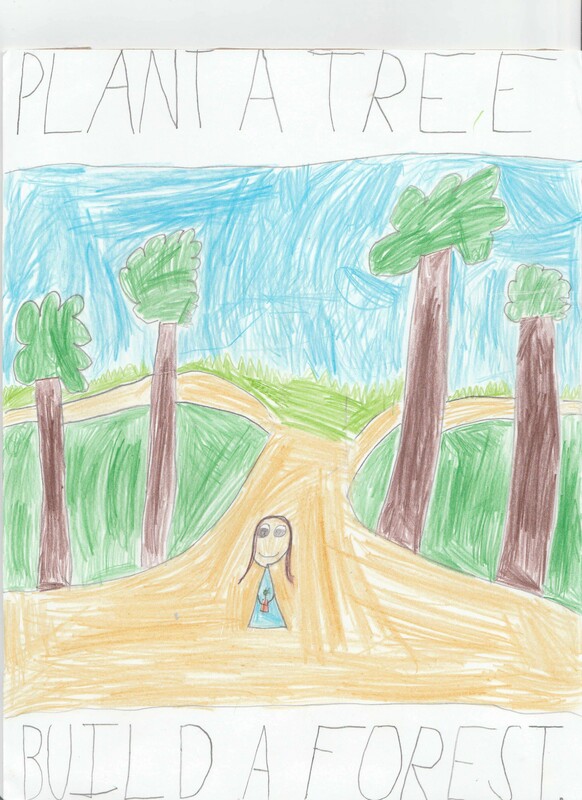 Hannah Weedman, a student at Christian Academy of Carrollton, was recognized as the state winner in the art contest. Her entry was one of 44,152 art entries from 96 counties across the Commonwealth. Weedman was awarded a monetary gift from Kentucky Farm Bureau. She also received recognition from Representative Rick Rand. The awards were presented by Scott Christmas of Kentucky Farm Bureau, Steve Coleman of Kentucky Association of Conservation Districts and Kim Richardson of the Kentucky Division of Conservation. She will also receive recognition on the local level from the Carroll County Conservation District. Ashton Dawahare, a student at Mercer Intermediate School, was recognized as the state runner-up in the art contest. His entry was one of 44,152 art entries from 96 counties across the Commonwealth. Dawahare was awarded a monetary gift from Kentucky Farm Bureau. The award was presented by Scott Christmas of Kentucky Farm Bureau, Steve Coleman of Kentucky Association of Conservation Districts and Kim Richardson of the Kentucky Division of Conservation. Dawahare will also receive recognition on the local level from the Mercer County Conservation District. Joseph Drake, a student at North Todd Elementary School, was recognized as the state third place in the art contest. His entry was one of 44,152 art entries from 96 counties across the Commonwealth. Drake was awarded a monetary gift from Kentucky Farm Bureau. The awards were presented by Scott Christmas of Kentucky Farm Bureau, Steve Coleman of Kentucky Association of Conservation Districts and Kim Richardson of the Kentucky Division of Conservation. He will also receive recognition on the local level from the Todd County Conservation District. Weston Young, a student at Taylor County High School, was recognized as the state runner up in the essay contest. His entry was one of 15,260 essay entries from 87 counties across the Commonwealth. Young was awarded a monetary gift from Kentucky Farm Bureau. The awards were presented by Scott Christmas of Kentucky Farm Bureau, Steve Coleman of Kentucky Association of Conservation Districts and Kim Richardson of the Kentucky Division of Conservation. He will also receive recognition on the local level from the Taylor County Conservation District. Lucas Gibson, a student at Willard Elementary School, was recognized as the state third place winner in the essay contest. His entry was one of 15,260 essay entries from 87 counties across the Commonwealth. Gibson was awarded a monetary gift from Kentucky Farm Bureau. The awards were presented by Scott Christmas of Kentucky Farm Bureau, Steve Coleman of Kentucky Association of Conservation Districts and Kim Richardson of the Kentucky Division of Conservation. He will also receive recognition on the local level from the Perry County Conservation District. Photographs courtesy of David Hargis.